She started with a free blog on http://lilianchan.blogspot.com on 4.38 pm October 23rd, 2004. In three years time, she owns over 24 domains with one Virtual Private Server and a BlueHost hosting. She makes over five digit RM per month. In 12 months, she made USD13K just from PayPerPost. Started with only two readers, her traffic now totalled nearly 5K unique hits per day. Her blogs are rated amongst the world top 100 (now at position 34) make money blogs. She is Malaysia’s top 50 most influential blogger. Some say she is one of the alpha blogger, meaning, the chosen ones favoured by local advertisers. Her blogs are ranked in the 70 most popular blogs. She is in the running with celebrities (hater) like Perez Hilton for the Most Obnoxious Blogger award in the Bloggers Choice Award 2007. Her blog is rated high as one of the lifestyle blog in the world. Position 12. She made a few enemies (because they are jeles mah) but mostly, her thoughts inspired many. If you do the maths, it is still positive. She is the few individuals who can manage multiple niche blogs at the same time. Food, faith, women stuffs, parenting, making money, digital photography, terminally ill children, bereavement support and lifestyle. 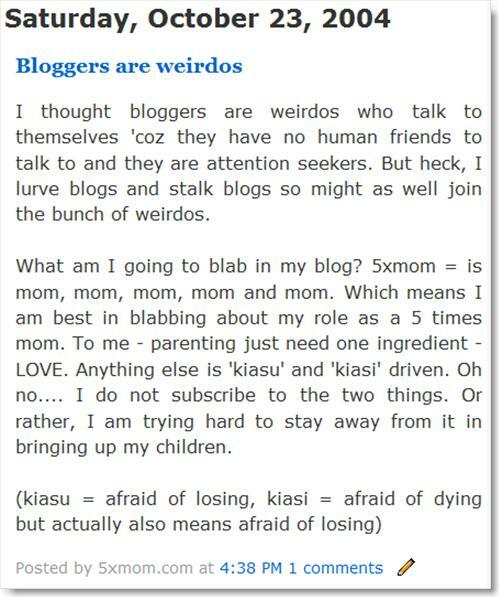 She cusses, she rants, scolds bad words but people are utterly smitten with her blogs. And please add some credit lah! Next Next post: Re-post – Women only post – Men, shooo! wow lilian, i am impressed….you certainly have made quite a name for yourself. Hmm… even i donlt make that much but slog so much and yet don’t get to spend time at home. Just wondering how you find time to juggle kids, meals, school and blogging your empire. I know most of your kids are big already but driving my 4 year old around has taken most of my time even its so nearby. Woah! I am very very impress! Can u be my sifu arrr??? I want to learn the art of making money. Have a nice day sifu!